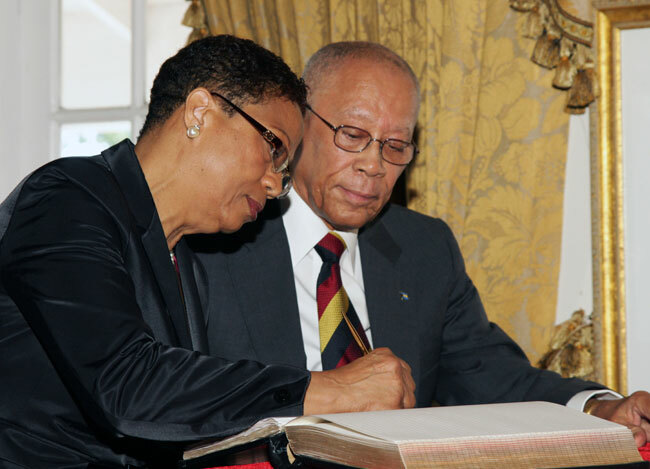 Governor-General Sir Arthur Foulkes presides over the swearing in ceremony of Senior Justice of the Supreme Court, Anita Allen, as President of the Court of Appeal. The ceremony was held at Government House on Friday, November 26. Pictured: President Anita Allen and Sir Arthur. (BIS Photo/Derek Smith). Nassau, The Bahamas – The third Bahamian female to be appointed to one of the highest office in the judiciary was sworn in during an official ceremony at Government House on Friday, November 26. 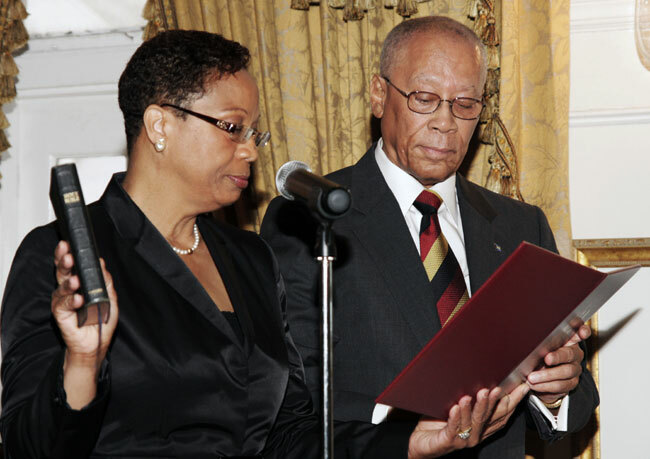 The Governor General, His Excellency, Sir Arthur Foulkes, swore in Senior Justice Anita Allen as President of the Court of Appeal. President Allen replaces Dame Joan Sawyer. 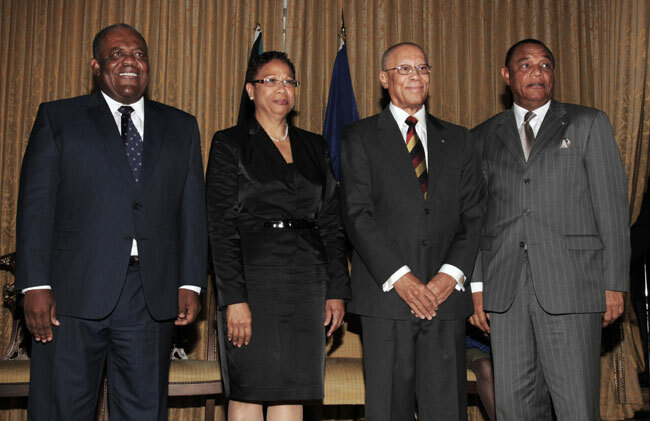 In the presence of a large cross-section of members of the Judiciary, Cabinet Ministers, Members of the Opposition and Senior Government Officials, President Allen was congratulated by the Prime Minister, the Rt. Hon. Hubert A. Ingraham, who said that it was his pleasure to ‘cause’ this appointment to take place. “On behalf of the Government and the people of The Bahamas, let me be the first to publicly congratulate you on your appointment as President of the Court of Appeal in The Commonwealth of The Bahamas,” Mr. Ingraham said. Mr. Ingraham added that she is the third president of the Court of Appeal whom he has had the pleasure of causing to be appointed, along with the leader of the opposition. Pointing out that females appear to be taking the lead in the judiciary of the country, Mr. Ingraham said that increasingly, Bahamian women are by far, amongst the “greatest legal stars” in the judiciary. President Allen has served as a Justice of the Supreme Court for over 14 years and has presided over matters in all sections of the court including civil, probate matrimonial and criminal cases. The new president of the Court of Appeal, Anita Allen poses with Prime Minister the Rt. Hon. Hubert A. Ingraham, Governor-General Sir Arthur Foulkes and Leader of the Opposition, the Rt. Hon. Perry G. Christie. (BIS Photo/Derek Smith). Born in New Providence on December 21, 1947, President Allen attended Government High School. She is a graduate of the College of Law in London, England and received her Certificate of Legal Drafting at the University of the West Indies, Cave Hill. During her expansive career, President Allen has served as Justice of the Supreme Court; Acting Chief Justice and Senior Justice of the Supreme Court, a post she has held since 2005 to the present time. She has written and published several judicial opinions including Financial Clearing Corporation v The Attorney General of The Bahamas et al; Pleasant Bridgewater v Zhivago Laing (Election Court – Marco City Constituency; Ryan Pinder v Duane Sands et al and Lady Henrietta St. George et al v Sir Jack Hayward et al (Ownership of the Grand Bahama Port Authority). Her extra judicial positions have included being a founding member of Zonta Club; Member of the Cathedral Chorale (1981-2005) and Editor of The West Indies Law Reports (2008 – present). She is married to former Cabinet Minister, the Hon. Algernon Allen and the couple has five children: Algernon Jr; Antoine, Aliya, Amil and Phylicia. 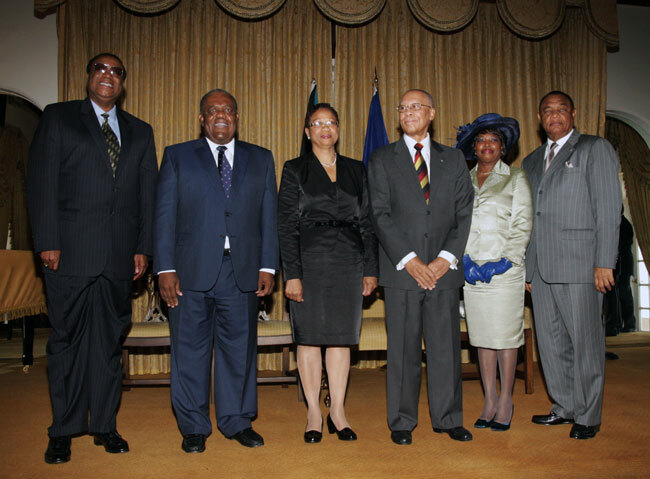 The newly appointed president of the Court of Appeal, Anita Allen, is flanked by left to right: Hon. Algernon Allen (spouse); the Prime Minister, the Rt. Hon. Hubert A. Ingraham; Governor-General, His Excellency Sir Arthur Foulkes, Lady Foulkes and Leader of the Opposition, the Rt. Hon. Perry G. Christie. (BIS Photo/Derek Smith).